Jennifer Love Hewitt, Frances Fisher, Keir Dullea et al. She was a fabulous beauty who became one of Hollywood's greatest screen legends of all time. Oscar winning acrtress, fashion icon, a woman with a heart of gold, she was everybody's dream girl. Her star performances in such movie classics as Breakfast at Tiffany's, Sabrina, The Nun's Story, Roman Holiday, Funny Face and My Fair Lady earned her immortality. But behind Audry Hepburn's dazzling public smile lay a life of private heartbreak, bitter wartime experience, shattered dreams, doomed love affairs and the search for the father who had walked out of her life. Through the glamour and sophistication of New York, Paris and Hollywood of the 50's and 60's, The Audrey Hepburn Story captures perfectly every bitter-sweet aspect of the life of a remarkable and genuine superstar. 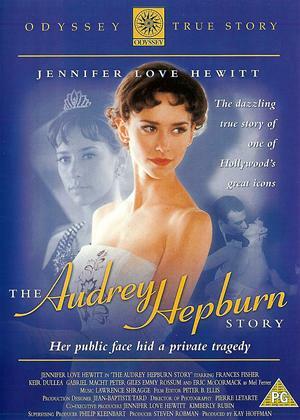 Everybody loved Audrey Hepburn so I assumed this film would be a documentary in her memory. Not so. When it started and my wife and I watched a simpering young actress playing the part we were appalled and felt like throwing something heavy at the television. The only genuine part was the sound of "Moon River". This film should not be sent out to your customers, who expect better, but delivered to the nearest dustbin or recycled.